There are two ways to frustrate kids with writing assignments. One is to be too general: Write an expository report, or Write a short story. Students are easily overwhelmed when the range of options is too broad. This is especially true for students who are not naturally enthusiastic or creative writers. The mistake on the other end of the spectrum is to be too specific: You are a raindrop running down a window pane; describe your experience, (student: I’m a what?) or Defend the legal enforcement of seat-belt laws in Iowa (student: Why should I care?). Assignments like this feel restricting to the creative, expressive type, and are too likely to be obscure and uninteresting for students who might need clearer direction. 1. Define the purpose and category of the assignment (and sometimes the audience). Given the option, some students would write nothing but fantasy stories. Others would talk about their favorite hobby or interest. Writing instructors need to push kids to write across the spectrum of purposes, or modes: narrative, descriptive, expository, and persuasive; so, define the purpose of the paper: This will be a persuasive paper. Your purpose is to convince your reader of a particular opinion or position. And often it’s a good idea to provide additional context: The format will be an informal letter that you write from summer camp. In this letter, you must convince your parents to let you do something they wouldn’t ordinarily be inclined to permit. This example is fairly narrow. Often the context can be less tightly defined. Occasionally, as in this example, it helps to define the audience as well. In fact, it’s a good idea to vary the audience occasionally so that students think about writing for someone other than a parent or a teacher. One of the important controlling factors for any writer is the person or people the work is intended for. 2. Allow the student to choose the actual subject matter. Most students need a coloring book, not a blank canvas. The guidelines in the example above provide the lines. The student can determine how, and with what colors, to fill them in. It doesn’t matter what the student seeks to talk his parents into in this example, just that he seek to persuade them of something. Send you $100 to replace the money you lost when you went swimming. Buy you a horse like the one you learned to ride at camp. Allow you to take a year off of school to tour the country on a motorcycle with your new friend at camp. Allow you to quit school and become an acrobat in the circus using the tumbling skills you’ve developed at camp. None of the above — something of your own choosing. This list of potentially interesting topics will particularly help the less creative student. For others, it will serve to trigger their own imagination. That’s why it is so important to allow students to ignore the suggestions and choose their own topic. 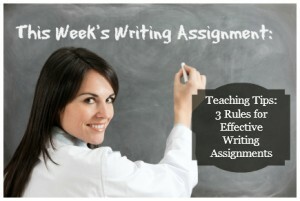 These three rules apply for any kind of writing: creative, academic, technical, practical, etc. The goal is to set clear boundaries within which a writer can get as much guidance and direction as he needs without stifling his creative inclinations. Please leave your comments and suggestions below! these tips will surely prove very much helpful for students to beat assignment stress. i appreciate you for this good and informatory piece of content. Wow. Thank you for this post! You have eloquently identified my struggles to writing. I’m learning how to write on my own and am often stumped in coming up with writing ideas. I mostly journal, although I’d like to write about other things as well. My assignments to myself are often too general and internet creative writing prompts are too specific. Thanks for helping me identify my problems so I can come up with better solutions! Glad to help. Let me know how it goes from here in out.